Boy oh boy do I hear you. I’ve seen this play out in the local, pan-Orthodox GOA church of my SEC hometown. Our church is about three miles from campus but still suburban not rural (no bus), and most of the active leaders in the parish are employed by the university. The parish’s active *involvement* with the university has been limited by the lack of a full-time priest, but I’ve seen part-time commuter priests with a vision for campus ministry still do some mighty work: there certainly is *plenty* of response from the campus when people get involved. It’s a mixed bag at worst, and I’ve seen plenty of tremendous good (including, in some years, a pretty well-managed system for getting people rides to church that *doesn’t* depend on the car-less student doing all the motivating and organizing). The local GOA Metropolitan has repeatedly said how important campus ministry is. But I haven’t seen much that could be called more than ad hoc local effort. In fact, most of the involvement I’ve seen from outside would be better classified as meddling, not support. I remember most vividly meeting, by chance, a devout Georgian couple who had been at university for over a year without any clue that there was an Orthodox church in town. They were in tears with joy to learn of our parish, and for the next while I drove them every Sunday. 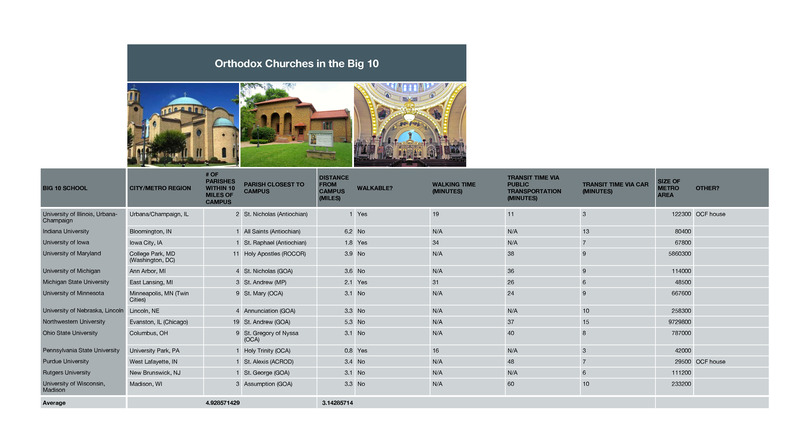 It was unsettling to know that our parish (and OCF) was so invisible that faithful Orthodox people at the university who really wanted to go to an Orthodox church wouldn’t know we existed.